Combined with healthy eating habits, physical fitness is an essential component of achieving and maintaining weight loss. With obesity rates rising over 60% in the last ten years, physical fitness is becoming increasingly important as a way to remain healthy. The trick to sticking with an exercise routine is finding a form of activity that you enjoy. There are all sorts of options out there when it comes to physical activity. Everything from sport teams to dance classes can help you reach your weight loss goal. Aerobic exercise is cumulative in nature, so three ten-minute walks throughout the day are just as good for you as one thirty-minute walk. Alternating through the week with your aerobic exercise should be strength training. Start off slow by using light weights or doing body-weight exercises that do not require any additional weight or equipment. When you are first getting started with strength training activities, don’t push yourself too hard. Make sure that you warm up and cool down fully every time you engage in one of these activities, even for a short period of time. Being active by engaging in activities like these on a daily basis can help you maintain your weight loss long-term. 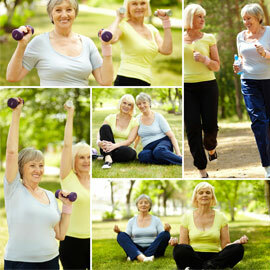 You can get started with exercise and physical activity at absolutely any age. If children can be encouraged to consider fitness activities of varying levels of intensity with as much interest as watching TV or playing video games, physical fitness can become a lifelong habit, and this can contribute to an overall healthier lifestyle long into adulthood.